When we bought our home we decided to hold off on replacing the ugly brown carpets for a few years because we have two little kids, one who isn’t potty trained yet, and we all have a tendency to drop stuff. 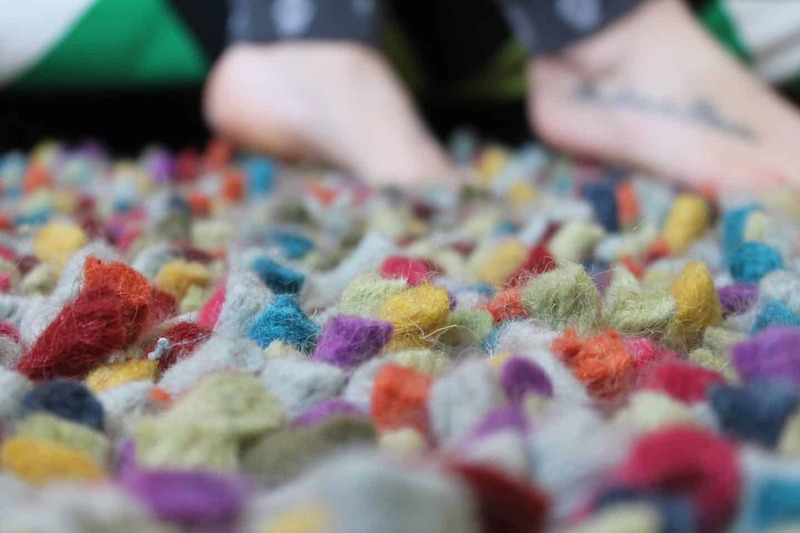 Much as I love the look of bouncy soft cream carpets realistically it would be a nightmare to keep clean and the kids wouldn’t be able to to do messy play, eat in the living room and I’d be militant about people taking off their shoes! So for now, the brown carpet stays. That doesn’t mean I’m not trying to cover it up temporarily with nice rugs though! 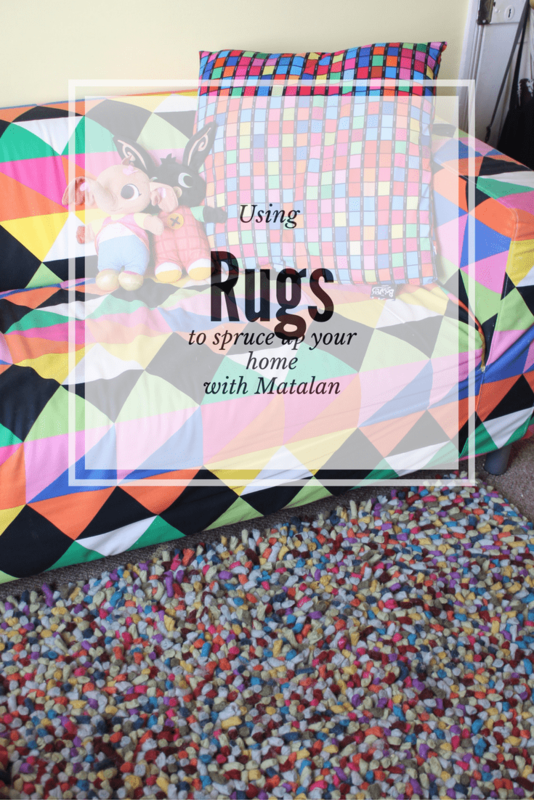 Matalan Direct recently gave me free range to choose from their huge online selection of rugs and I uhmmed and ahhed a bit and went for this gorgeous, bobbly, colourful thing! 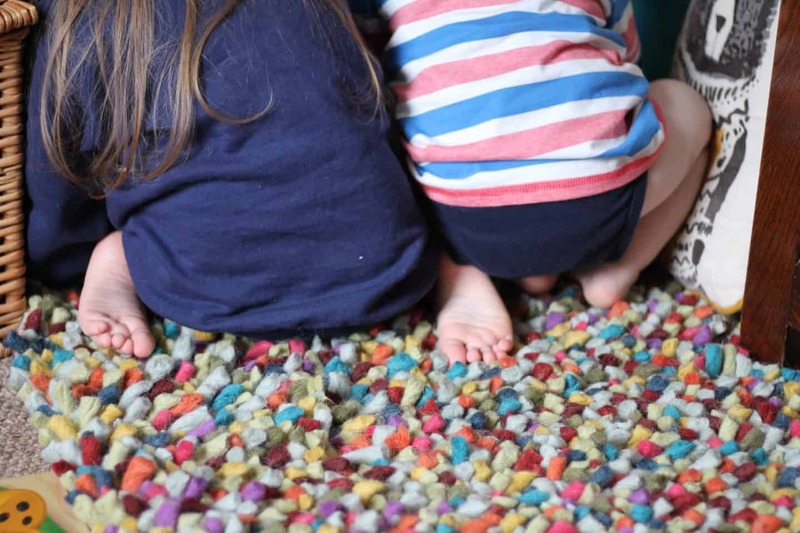 It’s called the Jellybean Rug and it’s so fun to walk on and both the kids pounced on it as soon as I unrolled it! It’s basically made of loads of bobbly bits of felty real wool and I love it! The problem is I’ve not decided which room to put it in yet! 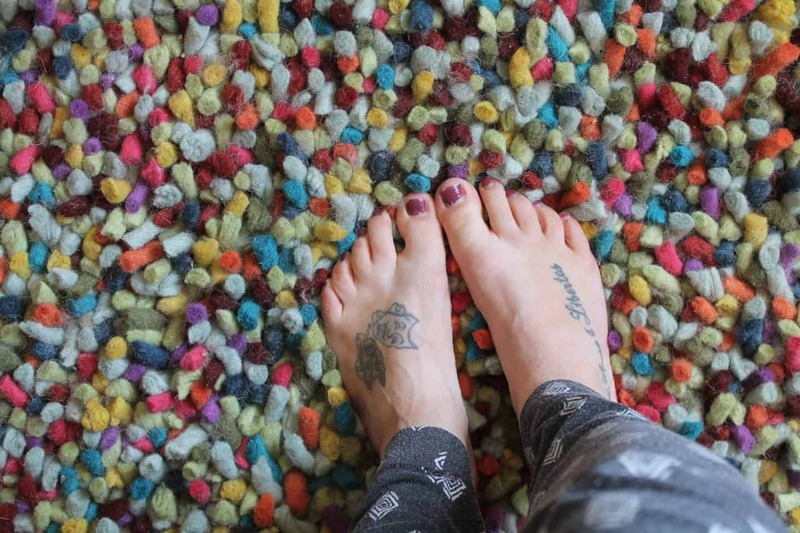 I’ve been playing around with it in a couple of different places but I guess the great thing about rugs is that they are easily moved from room to room as required, and can be swapped about with other rugs to change rooms around really easily. Here it is making the kids book corner nice and cosy in the living room. 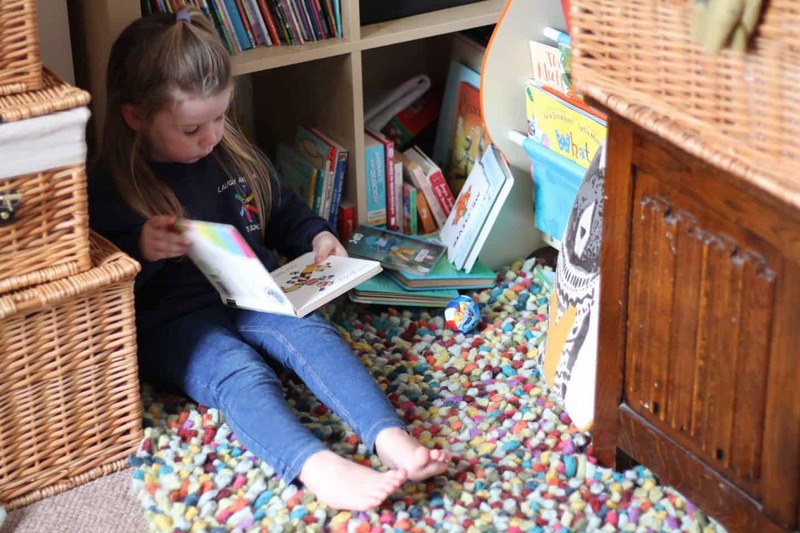 There is something really special about seeing little feet dig their toes into a fuzzy rug as they explore the world of books! It also helps to cushion the sound of little leaping legs as our living room is on the first floor and as we live in a converted cottage the floors are quite thin! In the winter it will help with a bit of extra insulation too! 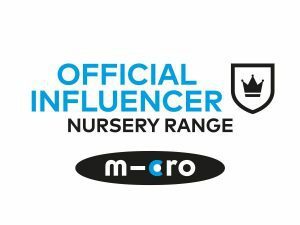 The other potential position for it is in the playroom (which actually doesn’t get played in much by the kids, they prefer the living room!) but quite often Sam or I can be found in here on our own to grab a bit of peace. It has a wacky bright sofa and I think the still colourful but slightly muted tones of the rug work really well. It also really helps to hide the gross carpet in here as the last people who lived here did god knows what to the carpet in this room! I think it will stay here for now, as it really brightens up the room and I love walking over it with bare feet on my way into the kitchen, it just feels so luxurious! I had no idea that Matalan Direct stocked half as much as they do online, from real wool rugs like this to bedroom furniture and some amazingly modern lighting too. I’ve got my eye on an industrial style tripod lamp for our living room side table! They’ve also got some amazingly on trend ladder style shelve units and some really cosy looking throws too! I picked and received a rug of my choice for the purpose of this review. All words and opinions are my own. Previous Post Would I terminate a pregnancy with a Downs Syndrome baby? That rug looks so cute but all I could think and cringe about was the feeling on my teeth! Why am I so strange. It would look so cute in the littles book corner! May have to get over my odd phobia.